MemeTune, the acclaimed London studio and label curated its first festival just down the road from its base in Hoxton at Shoreditch’s Red Gallery. Although lacking in natural ventilation, the sociable art space proved to be a fine venue to host live electronic music by WRANGLER, GAZELLE TWIN and MINNY POPS. 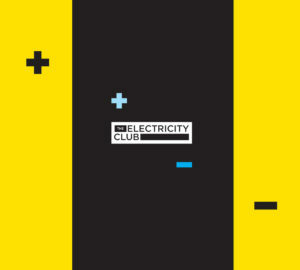 And several luminaries from the music scene were present including Hannah Peel, Serafina Steer, James Nice, Anais Neon, Martin Swan and err… Bobby Gillespie! Proceedings started at precisely 7.41pm with cult Dutch combo MINNY POPS who are probably best known for being signed to Factory Records and supporting JOY DIVISION at the notorious Bury gig in 1980 which ended in a riot. Formed in 1978 and named after the 1967 Keio Minupops 7 rhythm box and not the dodgy children’s entertainment show produced by Mike Mansfield, it began with vocalist Wally van Middendorp standing in the audience, blindfolded and silent for what felt like 10 minutes before holding a placard which announced “FAC57 NOT FUC57… Secret Story revisited” and launching into the track itsellf. It was all very art school and prolonged, but there appeared to be a glint of sly Low Countries humour lurking. A new song ‘Patti Hurst’ followed as coruscating guitars, mournful string synths and the band’s trademark drum machine reverbed around the venue like INTERPOL trapped down a well. Wally van Middendorp was charismatic if nothing else with his dead fly moves and deathly baritone… it all rather made JOY DIVISION sound like STEPS. With their early albums ‘Drastic Measures Drastic Movement’ and ‘Sparks In A Dark Roomm’ out now as 2CD deluxe packages via Factory Benelux, MINNY POPS’ polarising experimentation is being re-investigated by a new audience if nothing else. With the level of the PA raised a notch, the rumbling sub bass caused part of the lighting rig to judder and drop off the front of the stage just before the fierce and uncompromising GAZELLE TWIN commenced her set. 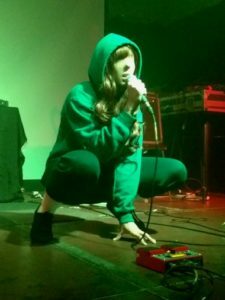 Sounding tune-based in comparison with MINNY POPS, GAZELLE TWIN aka Elizabeth Bernholz stalked the stage like a caged animal, occasionally dropping to her knees to (almost) worship her loop pedal. In what was the most minimal of set-ups, a hooded programmer / sample player triggered and manipulated a tiny podium-based sample pad whilst Bernholz projected a completely asexual persona. 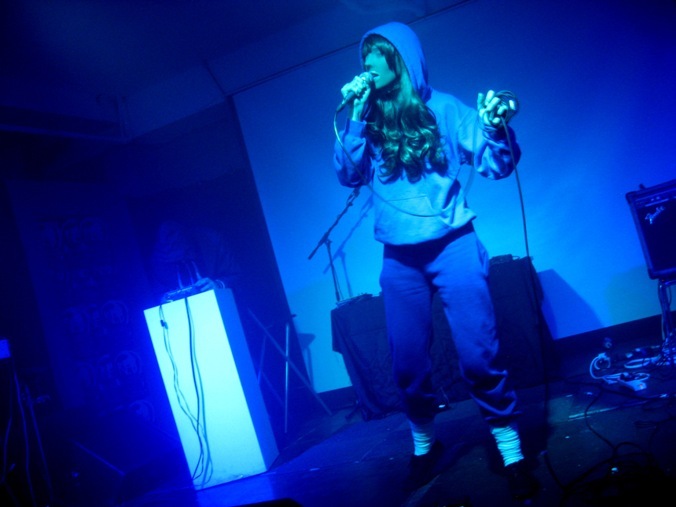 With her facial features disguised with a sheer stocking mask and dressed in a deliberately unflattering hooded track suit tucked into a pair of sports socks, the cumulative effect was to focus the listener on the music. In her interview for TEC, Bernholz admitted to being a nervous / anxious performer, donning a mask and anti-fashion dress code in an attempt to distance herself from the standard “LOOK AT ME!” stage persona – if anything, this unique approach makes GAZELLE TWIN even more voyeuristically watchable. Unlike much current electronic music, there was very little common frames of reference here, songs from current album ‘Unflesh’ drifted into each other, shards of melody occasionally appearing, then disappearing and the vocal hook “It’s coming at me” of the album’s title track being the most memorable of the evening. What impressed most was Bernholz’s vocal range and ability to switch into different styles, this combined with a charismatic stage presence meant that the Red Gallery crowd were held in rapture fully for the duration of their 40 minute set. 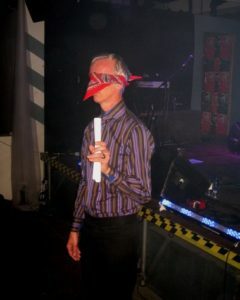 With the headline act WRANGLER approaching, it became apparent that most of the Red Gallery audience were here to see Stephen Mallinder’s new outfit as the crowd significantly filled out during the break after GAZELLE TWIN. 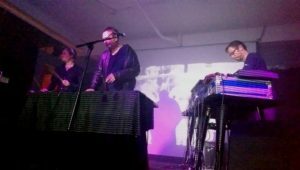 In the seminal ‘Made in Sheffield’ documentary, another former CABARET VOLTAIRE member Chris Watson ruminated as to what the ‘perfect Cabaret Voltaire performance’ would be, whether it was driving around Sheffield city centre in a van blaring out their music or even in a public toilet somewhere. But tonight the Shoreditch venue with its superb sound system suited WRANGLER perfectly, the gloomy and arty ambience although initially intimidating, suiting the dark / dystopian sound of the band to a tee. On the left of the stage, JOHN FOXX’s right hand man Benge spent most of the performance hammering away at a minimal twin pad drum synth whilst on the other side of a centrally placed Mallinder was Phil Winter who handled synths and MIDI controllers. With just one album under their collective belts, most of the evening material was taken up with tracks from ‘LA Spark’ with the title track, ‘Lava Land’ and a Kaoss Pad driven ‘Mus_IIC’ all getting strong outings. The biggest cheer of the evening was reserved for a faithful version of The Cabs’ ‘Sensoria’, the sequenced riffs and danceable drum patterns getting the crowd really moving. What also impressed was the use of front screen projection onto a curtain in front of the act, the recognisable WRANGLER “W” logo and a variety of semi-3D computer graphics appeared to float hypnotically in front of the band during their hour set. Drawing the set to close, the final track of the night was a re-worked version of ‘Crackdown’. Despite the dark nature of their material, Mallinder and the rest of WRANGLER seemed to thoroughly enjoy themselves throughout and the combination of the diverse acts on the bill made this a perfect way to enjoy a Saturday nights electronic music. 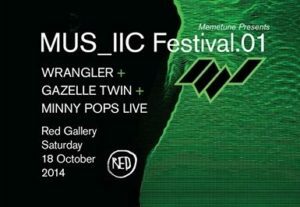 On the strength of tonight’s event, it can only be a matter of time before we get MUS_IIC Festival.02.